You are here: Home / Marjon / Flying Start @ Marjon WINS PRESTIGIOUS AWARD!! Flying Start @ Marjon WINS PRESTIGIOUS AWARD!! 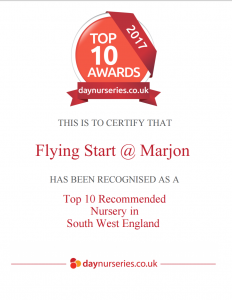 FLYING START @ MARJON IS OFFICIALLY A TOP-10 RECOMMENDED NURSERY IN THE SOUTH WEST!!!! We are delighted to announce that Flying Start @ Marjon has won an award, for being named as one of the top 10 nurseries in the whole of the South West!! This is an incredible achievement for nursery manager Vicky Cochrane & her amazing team! Thank you to all the parents who left reviews on the www.daynurseries.co.uk website, and took the time to celebrate the nursery and amazing staff who are giving your child a flying start!! https://www.flyingstart.uk.com/wp-content/uploads/2017/03/c9a4712652fe11b6727d4fc7bf66d6ff_celebrate-banner-clipart-celebration-banner-clipart_3902-1473.png 1473 3902 Steve https://www.flyingstart.uk.com/wp-content/uploads/2014/02/Flying-Start-logo1.png Steve2017-03-31 10:28:442017-03-30 23:34:40Flying Start @ Marjon WINS PRESTIGIOUS AWARD!! 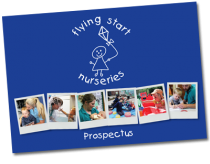 Flying Start Nurseries Are Named In Top 15 Nurseries In Cornwall!!! Flying Start @ Camborne Welcome Beautiful Butterflies!